‘Island Gardens’ is a single or multi screen audio visual video project or live performance centred on small island cultures. The complete project is nineteen videos, to be screened together or singly on digital flat screens with or without headphones. The running time is just over two and a half hours. Shot during artist residencies on Pulau Ubin, near Singapore, Lamma Island near Hong Kong, the Greek island of Syros in the Cyclades, several small islands near Bangkok, Bali, East Timor, Sri Lanka, Guadaloupe and Dominica…so far. Filmed on a variety of media – video, super eight film, re-filmed video and re-filmed super eight etc. I have connected the islands through various threads of story telling, myth, magical thinking, sound, fiction, found archive material and information culled from different sources. In my many travels I have visited many islands and places with islands around them. Among them Fiji, Tahiti, Hawaii, New Zealand, Singapore, Northern Borneo, Hong Kong, Japan, Thailand and Malaysia. My fascination with islands originates from a variety of influences in my youth; amongst them was having to read William Shakespeare’s play The Tempest (quoted above)and The Kon Tiki Expedition by Thor Heyerdahl for my final English Literature examination at school. Various historical, musical, imaginary and mythical Borgesian like threads, coincidences and concerns join my videos together. Hauntology, disappearance, re-appearance; the permanence of impermanence and the constant presence of the past as shared histories of colonisation or occupation. The Ferryman, without whom you cannot reach most islands, is recurring theme. The ferryman has mythical meaning in many cultures connected with death and magical thinking. Some of the videos share the same soundtrack and some soundtracks are from a completely different island than the one you are watching. There are references, direct and indirect, to other film and video makers, storytellers and myth makers. There is a concern with nature and ecology. The fact of walking, the psychogeographic drift, the derive, in these islands and listening as a mode of meditation, often in places said to be held sacred to the local population, was the point of departure; to seek out ‘Listening Spots’ and to map them and guide people to them as being places where one could perhaps experience something, possibly quite ordinary, but, at the same time perhaps deep, quite extraordinary and spiritual. Magical Thinking, Spirit Songs and Walking On Leaves On Islands. Magical thinking looks for meaningful relationships of coincidences between acts and events. ‘Spirit Songs’, in the context of this work, signifies ‘field recordings’ or recordings of the ambient sound of the various locations visited. The title I chose,’Spirit Songs’, is influenced by Marina Rosenfeld’s book Healing Sounds From The Malaysian Rainforest (a study of Temiar Music and Medicine); The Land Of Remorse (A Study Of Southern Italian Tarantism) by Ernesto De Martino and Sound and Sentiment (Birds,Weeping,Poetics,and Song In Kaluli Expression) by Steven Feld. The Kaluli people of Papua New Guinea believe that when we die we become birds. ‘Walking On Leaves’ comes from an expression used by the Free West Papua Independence Movement who claim their leader, Goliat Tabuni, can ‘walk on the leaves of trees’ – in other words magically appear in places at a great distance from one another in a very short time. Lamma island is a part of Hong Kong and is the third largest island of Hong Kong. Hong Kong became a colony of the British Empire after the First Opium War (1839-42). Originally confined to Hong Kong Island, the colony’s boundaries were extended in stages to the Kowloon Peninsula and the New Territories by 1898. It was occupied by Japan during the Pacific War, after which the British resumed control until 1997, when China regained sovereignty. The indigenous people are Taoist, Confucian and Animist. I was there as artist in residence in 2013 for the Soundpocket organisation. Syros is situated in the Greek Cyclades islands, It appears in ancient times to have been inhabited by the Phoenicians. In the Odyssey, Syros was the country of the swineherd Eumaeus . The island was also the home of Pherecydes the philosopher, teacher of Pythagoras. It is a Catholic and Greek Orthodox Christian culture and a history which includes the Ottomans. They did not take part in the Greek revolution of 1821 and as a result, Syros became a secure shelter during the Revolution, attracting many Greek refugees from Asia Minor, Chios, Spetses, Psara, Aivali, Smyrna, Kydonia, Kassos and other places. In the 19th century the port of Ermoupoli was the most important port in the Greek islands. During the second World War Syros was occupied by both the Italians and the Germans. I was ‘invited artist’ at Syros Sound Meetings workshop in 2013. Bangkok is not an island but along the Chao Phraya river, which runs through its centre, there are nearly 40 floating metal river taxi boat stations. Each one an ‘island’. This was the first film in my ‘Island’ project. Originally filmed on super eight film and then screened onto a piece of A4 paper and re-filmed using a 40 euro 2.5 pixel video camera and ‘worked on’ in iMovie after. The soundtrack was recorded on mini disc and is one of several recordings of the ‘voice’ of the platforms. Each platform is able to rise and fall with the changing depth of water in the river by means of nylon rollers and pylons securing it to the river bed. As the platform moves it produces a sound – its ‘voice’ – each one unique. 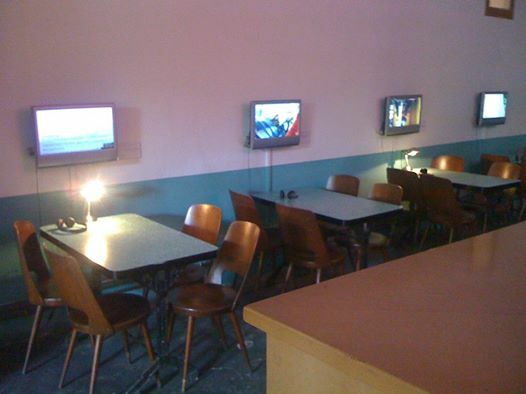 View of my installation at Son De Plateaux – 8 @ GRIM Marseille 2014 on four screens.